Following the recent news of the upcoming Statue of Zeus, Iguana Sell, a purveyor of luxury goods out of Spain, gave us a preview of an upcoming Maki-e limited edition fountain pen today in a post on The Fountain Pen Network. The new model has been named Spring & Autumn. This appears to be an ambitious Maki-e release, encompassing both traditional Maki-e and Raden techniques in a veritable patchwork of thematic motifs. The pen’s finish is designed to symbolize both of its namesake seasons. The imagery includes cherry blossoms and maple leaves, both symbolic of their respective seasons in Japanese culture. Gold leaf is employed to create three traditional Japanese designs on the cap. These include flowing water in green, a hemp leaf in brown, and a golden stripe. There is an area of blue abalone shell on the barrel of the pen, creating a Raden effect. An additional area of stripes in violet depict eternal love. Yet another area in silver is done in the Harikiri technique. Several different Maki-e techniques exists and Harikiri entails generously sprinkling gold powder over a design and then carefully removing it with a needle in selected areas so that the original design shows through the gold dust. 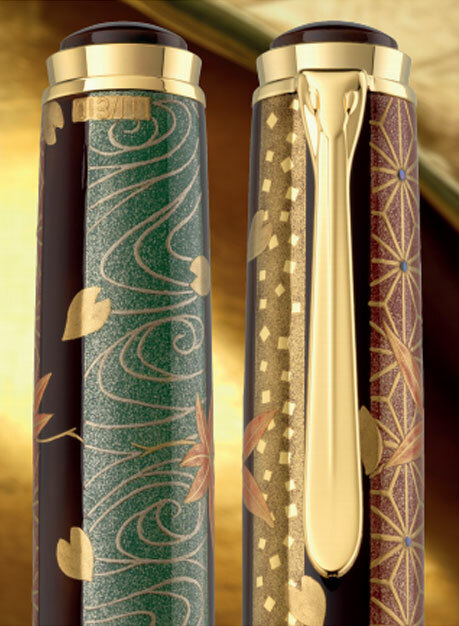 When taken as a whole, these different panels come together to give the front of the pen, where the clip resides, an Autumn motif whereas the opposite side depicts a Spring design. This will be a limited edition release of just 111 pieces worldwide. The intricacy of the design and the limited quantity produced result in these commanding very high prices at retail which makes owning one of them unrealistic for most of us. This pen is based on the M1000 chassis. There will be a crown cap top featuring the Pelikan logo along with the traditional beak clip and the standard gold-plated trim of the modern Souverän. The furniture includes two trim rings at the piston knob, two cap bands, and a single trim ring at the section. There is a dark anthracite ink window and the nib will be the standard two toned 18C-750 gold. Each pen will have a limited edition number and the artist’s signature hand drawn using Maki-e. As is customary, the pen will come in a wooden box made of paulownia wood. Further information is not yet available about this model but given the timing of the announcement, we can anticipate release sometime within the next 4-6 weeks. 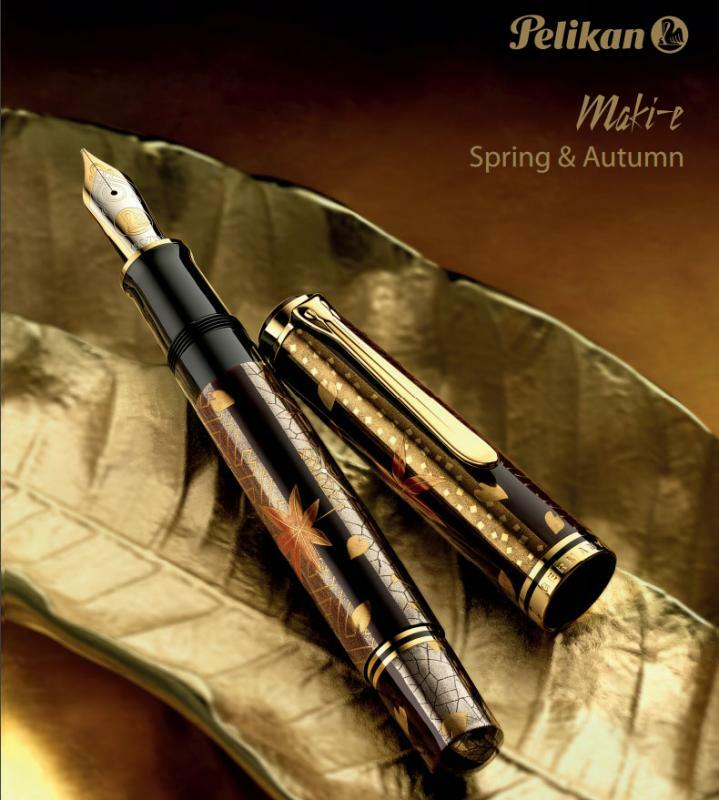 In the meantime, if you haven’t already seen it, check out the amazing video below from Pelikan which depicts artist Mushu Yamazaki making a Pelikan Maki-e fountain pen. When I look at these pictures, I’m reminded of a patchwork quilt with many separate panels stitched together. Unfortunately, I do not find the design flattering and while I have always admired the Maki-e pens, I have no problem with missing out on this one. What are your thought’s on Spring & Autumn? UPDATE 9/30/16: New information indicates that this pen will retail for $3595 with a street price of approximately $3305. As anticipated, the artistry and rarity of the release has set the price incredibly high and out of reach for most enthusiast. Thank goodness at least this is on the M1000 frame. I love the maki-e. Gorgeous. I haven’t had confirmation that its an M1000 frame but believe it is so based on the double etching in the scroll work on the nib. Only the M1000s have that so it seems logical. Plenty of canvas on an M1000 for some beautiful Maki-e artwork. I agree on all accounts. Beautiful, intricate, and expensive. stunning work. too bad too large in size and out of my price range. I think that this one is out of most people’s price range unfortunately but I guess we can all dream. Retail in USA is $4500 Street is close to your guess at $3375 range. I was able to get #76 and my guess is can a Summer/Winter be far behind, Hoping to get #76 for a matched pair for whom ever might buy the Spring/Autumn. Congrats on snagging #76 and thanks for sharing your insight on the pricing. Still too rich for my blood. I didn’t think that you would have trouble moving that one. Congrats on the sale.